I plan on staying put here in Florida although I do love to visit your state. I've always told my girlfriend that she is welcome to move to California anytime. I also told her that I'd miss her and would visit when I could. I do know it's expensive but it is beautiful out there. As is Arizona and Utah, I love both places as well. My girlfriend is a tax attorney and she knows the value in Florida for retirement, when that time comes. Now that we have 3 very nice annual aviation expos/shows here in Florida and great weather for year round flying why would I go anywhere else? Hey guys, new here. I’m a private pilot with instrument and multi engine ratings, also an A&P with inspection authorization. I have my own aircraft maintenance shop and one of my clients is a startup flight school that recently added a Sport Cruiser to their line. Figured I better find a place to learn everything I can about these planes. They look like good airplanes, I might consider getting one myself. I got checked out in the flight school’s SC last month and it took me a bit to get the hang of flying something so light. The last few years I’ve been flying my Cessna 310 almost exclusively so the SC was quite a change. Then I remembered flying a friend’s Grumman Lynx and it clicked. They have very similar flying qualities. The SC climbs way better but roll and pitch they’re a pretty a close match. way back in 2003 or so I attended a 3 day Rotax class in Sebring FL, I’ve worked on a couple experimental airplanes that are Rotax powered but I’m far from proficient with them. Been reading through some posts on here and it looks like there’s a lot to learn about their proper care and feeding. Anyway, just thought I’d check in. Welcome to the forum Russell. You found the right place for EVERYTHING SportCruiser. The "start up" flight school you mentioned, is it in Texas by chance? The SportCruiser is a joy to fly and is very responsive as you probably know by now. It is a light aircraft and some transition training is always recommended to anyone making the move over from those large, clunky GA aircraft to a light, sleek AND MODERN LSA. I just earned my LSRI certificate last week that allows me to do my own annual condition inspections on my SportCruiser and I plan on taking the Rotax classes in the coming months. I've been an owner since 2013 and love the airplane. What state are you in? I'm sure we have owners just about everywhere these days. Welcome aboard and I hope we all can help you in any way we can. LOL, the very definition of "clunky" is awkwardly solid, heavy, and outdated. Sounds like GA to me. All kidding aside, I know they are making new aircraft these days but I have to poke fun at those "clunky" aircraft. Do you know the year of the SportCruiser at the school? There are some subtle yet distinct changes over the years. They are easy to work on and most everything is accessible. Some items will require the assistance of a Cirque du Soleil performer to get to but I'm sure you've experienced this on other aircraft you've worked on as well. I've been over every inch of my plane and know it inside and out. If you haven't already, download the IPC (illustrated parts catalog) and the maintenance manual for your shop. You can find them here if you dont already have them. Great reference material. Now the SportCruiser sales guy in Sebastian will chime in here and tell you they are and swear up and down that it's a great flight school aircraft and talk ROI and dazzle you with pixie dust (because he's paid to) but many of us here know better and that they are not exactly built for the average flight school. Want proof? There's a large flight school out west who can verify this with a phone call. Make sure you have some free time and a cold, adult beverage in hand before you pick up the phone as the call will be lengthy. Ask me how I know. They have numerous SportCruisers that are damaged beyond flying because of the students. The SportCruiser, she's a rather delicate flower and in my opinion not really ready for the prime time abuse of the average flight school. Make sure your friend keeps a close eye on the plane and you as well if you are doing the maintenance for him. There are many tell-tale signs to look for that signal forthcoming issues or prior abuse. On occasion I do but then it keeps me away from this amazing forum. Sometimes I can only catch up at night, case in point, last night. Life is short . . . stay awake for it! I'd be glad to Russell. Can you tell me the year of the SportCruiser your client owns? As I said in an earlier post, what to look for would depend on the year of the plane. Of course there are all the SB's that have been issued over the years but there are also some quick inspections you can do on a regular basis and items to keep and eye on a bit more closely since this is a flight school plane. I understand that not all flight schools are created equal whereas some are for professional pilots where they come in with a private rating already and other flight schools where the person who's never even seen a plane up close wants to learn to fly. Each will apply different "forces" on the SportCruiser. I also sent you a private message with my direct contact info. THANK YOU for “Introducing” yourself on the SCFLIER SportCruiser Forum. Welcome ! 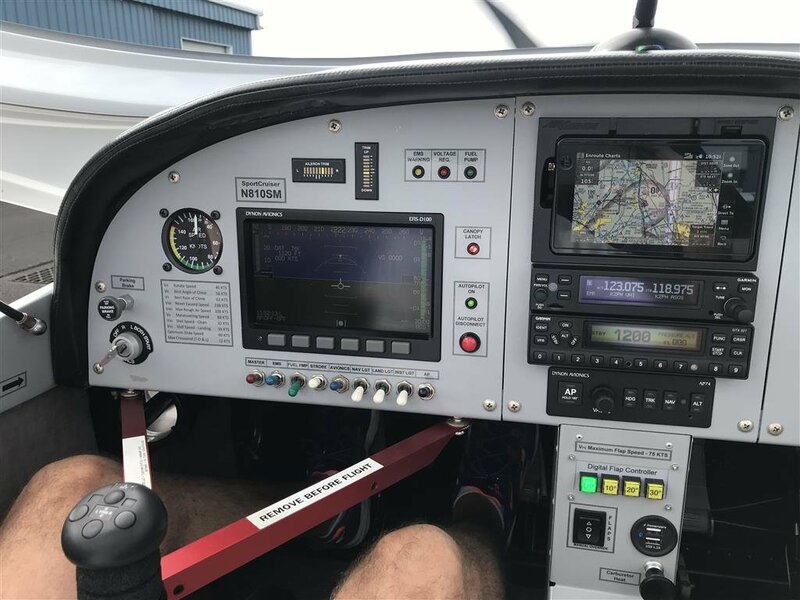 very interested in the kit built, Jabiru powered SportCruiser, your new instrument panel, and also the UK Light Aircraft rules. the pictures look great ! Awesome airplane. looks like you have the Dynon Angle of Attack probe under the left wing ? How is your static port done ? I wonder if your engine cowlings would fit a USA Experimental E-LSA SportCruiser/PiperSport ? The large round cooling air holes on front look to be just the thing to cool down a Rotax 912 engine ! Do you know where the original kit builder bought these engine cowlings ? They look very useful ! looking forward to hearing more about your SportCruiser panel Upgrades and incorporation of the GARMIN G5. Thanks Dave, Sorry so long in responding. For some reason couldn't get back into the site. Im a reasonably new private pilot and loved the look of the CRUZ. In the UK there are around 20 Jabiru 3300 powered versions. There is a lot of talk about them overheating easily but not sure if that's not just scaremongering. On climb out I will get a CHT Overheat warning but a stepped climb will negate that. Yes Dynon AOA, Static port again is the Dynon Kit. Simple to fit, basically a couple holes drilled near to the hair intake scoops. No idea about the cowlings, getting any documents on the Jabiru version build has been pretty difficult. Welcome James and I "fourth" all that, beautiful plane and thanks for sharing. I'm in Clearwater Florida so "somewhat" close. I've been up to Douglas Georgia for lunch but that's not even close to where you are up in the north end of Georgia. The Carling switches (or similar) you have are very nice and can be custom etched for anything but they do take up a lot of real estate.The mounting panels they offer also make for a clean install. I considered them for a while but decided to stick with switch/breakers for some added safety without the need for even more circuit breakers. I like the carbon fiber look of the panel as well and also thought about doing this but with a gray color to match the interior a little more and make the instrument pop a little. Beautiful plan and great work. Are you happy with the Jabiru engine? Any issues? Sorry shawn for taking so long to respond. I didnt realise I had responses! Yeah I am going to redo the console over the next winter break. In retrospect as you said the switches take up way to much space. Going to remove the iPad holder, impossible to see the screen in the sun. Planning on another HDX there, with a G5 in the centre console section. The 'carbon fibre' is 3M stick on. It looks good but am also going to change it as well, maybe do grey as you said. Ideally I would like to get an actua carbon fibre custom panel with teh copilot side slightly angled towards pilot side. Only problem is Im not capable of doing that myself so have to find someone and just dont' know where to start. Teh Jabiru runs well. There is lots of talk about them overheating but TBH mine is fine. I was thinking of doing the watercooled option but I have no real need. CHTs get a bit high on No 3 cylinder on climb out put go back down as soon as you take some power off. Hi James, no worry on the late reply, glad you were able to get back on the forum. As for the Jabiru overheating we have people here in the US with the Rotax doing the same thing in the newer SportCruisers. They crammed so much more "junk under the hood" in the later versions that they tend to overheat also in the hotter summer months. CSA came out with a "bandaid" but only for the brand new planes, go figure, no help for the people who actually need it with older legacy SportCruisers. I completely redid my center panel with all new avionics over a year ago now. Replaced my GPS, radio, transponder and added the Dynon AP-74 autopilot control. Here's what it looks like now. I too have thought about carbon fiber panels and have all three panels drawn up in CAD. I also recently bought a CNC router that I can machine parts on. I've made a few parts for my SportCruiser and also some parts for some friends who own experimental helicopters. I use to own a Rotorway helicopter before I bought my SportCruiser. I am going to cut all three panels soon in some plain, clear acrylic so I can test fit everything BEFORE I attempt to machine the carbon fiber. As you know acrylic is CHEAP compared to carbon fiber. I'd be glad to cut your panels if you can supply me with a drawing of what you want. Are you still in Atlanta or did you go back across the pond? I'll gladly send you some pics of my test panels once I get them cut. I plan on using the matte finish carbon fiber panels and possibly applying water slide decals for all the text. Then a matte finish clear coat to seal everything in. I can also engrave text in the panels down to 3/32" tall (about 2.4mm). I can then paint fill the lettering with enamel paint for a professional look. This is my preferred option but I'll have to test this out first. This is an image of the CAD file for my 2007 panels. Your panels are taller as CSA started this in 2010 with the PiperSport version here in the US. From your pics I can see you have the taller panels. I dont have a CAD file for those but if have the build prints or could run those down from a fellow owner in the UK I can create a CAD file from those. Then cut them on my CNC so they are machined perfectly. As far as angling the copilot panel you may find it not necessary with a screen that is anti reflective. I can see my D-120 screen perfectly in full sun at any angle. I think the problem is just the iPad and the sun. It's quite reflective I know as I also carry one as a backup when I fly. Have you tried sitting on the passenger side and looking at the HDX? Can you see it ok? In full sun? Just curious. Glad you made it back on the forum.